Shenzhen Tianxing Chuangzhan Electronic Co., Ltd.
HDMI (Type A - full), 3.5mm A/V connector. This HTPC uses the same formfactor as the Langcent H6S but has a different board and therefor different settings. Issue: There appears to be some issues with the PHY drivers. This results in not being able to properly detect if a cable is connected to the ethernet port (it thinks there's always one connected regardless). If you're using a connection manager that tries to maintain a single connection you'll have problems. For building u-boot, use the TXCZ_A20 target. Due to a lack of USB device ports, FEL is not possible. There are no screws, only plastic clips. There is one clip on each of the 4 corners and one in the middle of each side excluding the back (so 7 clips in total). Just turn the device upside down and gently push your plastic tool between bottom and top cover until they release. 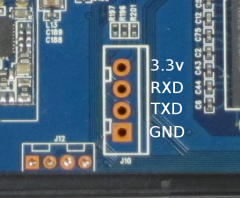 There is a 4 hole connector labeled J10, all you need to do is solder on some wires according to our UART howto. Langcent H6S: a highly similar device using the same formfactor. This page was last modified on 21 May 2015, at 20:09.